Closed-circuit rebreathers have become very popular with technical divers since they offer the possibility to do extreme dives without the imposition of carrying an enormous amount of gas. I was at the forefront of promoting this new way of diving as far back as 1993. In those days I had the privilege of using a prototype PRISM rebreather, taught under the auspices of its inventor Peter Readey. I wrote an article for Diver Magazine (UK) that was entitled “I have seen the future and it works”. However, the early units we used had neoprene counter-lungs and we even dried out our scrubber material in the sun before repacking it, promising CO2 poisoning. How we were not killed was down to luck. I experimented on terra firma with hypoxia by breathing from the unit with the O2 turned off. I wanted to know what the symptoms of oxygen starvation were. I discovered there were none. I simply went out like a light. If I was underwater I would have drowned but luckily I only suffered a severe headache for a day. Don’t try that at home! However experienced you are as a traditional open-circuit scuba diver, you need to get trained and learn new techniques until they become second-nature if you are to use a rebreather safely. My first proper certification was by Rob Palmer and as TDI SCR diver #4 on the Dräger Atlantis semi-closed-circuit rebreather. However even during the course one of the other trainees suffered a thoroughly unpleasant soda lime influx. It was food for thought. My introduction to closed-circuit came courtesy of Martin Parker and Dave Thompson, who had made some prototype rebreathers that were the forerunners of the AP Inspiration. Every time we surfaced, we joked it was amazing that we were still alive, we used so little gas. An article in Diver Magazine (UK) followed. I couldn’t wait to get to use a production model and within a couple of years, I found myself away in the Maldives with Martin with the very first fully finished units. The performance possible was exciting and I wrote about this too in Diver Magazine (UK). We didn’t have any dive computers that were appropriate for closed-circuit diving then so we introduced a bit of guesswork into the dives by setting the equivalent nitrox mix on our OC computers for the planned deepest part of the dive. One dive did not go as planned, resulting in a very long ascent time indeed! Martin Parker certified me as APD CCR Rebreather Diver #4. It seemed #4 was my lucky number. At that time, the duration of the Inspiration scrubber unit was thought by some to be to be longer than it was. There was one notable early death caused by running the same material for more than 10 hours. The manufacturer’s specification for the duration was changed to 3 hours with dire warnings to accommodate this phenomenon. That’s the Inspiration’s duration at the CE test rate – 40RMV in 4°C. Later, the manufacturer introduced a temperature stick that gave an indication of scrubber efficacy. Nevertheless, divers still had to pack and manage their CO2 scrubbers efficiently. I took an Inspiration on various diving trips and boat owners were very accommodating, allowing me to dive alone since in those days CCR divers were few and very far between, but the popularity of CCR seemed assured. It was in Cocos when I managed to do a dive while being distracted by my camera and photographing a whaleshark. I failed to set my high set-point at depth and could have seriously injured myself if I had not opted for in-water recompression (using the unit as an oxygen rebreather). Later, manufacturers introduced automatic set-point switching after they realised there were stupid people like me using them! Nowadays the calculations of a deco computer built into each unit takes care of that sort of error too. However, during this time there were some mysterious deaths of early adopters, all very experienced divers. It appeared some had turned off their O2 supply in the shallows (to save gas?) not realising that the body needs a greater volume of oxygen as the ambient pressure decreases. Some fatalities were simply unexplained. I gained my own theory about these unexplained deaths when away in the Sea of Cortez with a closed-circuit PRISM Topaz. Obsessed with hypoxia as a danger, we had all overlooked hypercapnia or CO2 poisoning, another real killer. It had taken a back seat as a danger from the past. I found that it was possible to stupidly install the scrubber canister upside-down in the darkness of early morning and thereby by-passed it. (The unit was later redesigned to prevent this.) I suffered a CO2 hit on the surface before diving but managed to jump in the water, I was so confused. Recovered to the boat, I had nearly suffered a heart attack but survived after a full day’s rest. Luckily I was dive fit. It was devastating. If it had happened during the dive, I would have been credited with having had a heart attack. I then went on to use the Sentinel rebreather under the watchful eye of its inventor Kevin Gurr, the Scandinavian-made JJ Rebreather with Dave Thompson and the Poseidon Mk6 with Jack Ingle. Articles in Diver Magazine followed. Advances in oxygen cell technology and electronics had made oxygen level management a cinch. There were also adventures with the Evolution, a travel version of the Inspiration and Recreational versions of both Evolution and Inspiration that promised to take all the errors out of practical use. 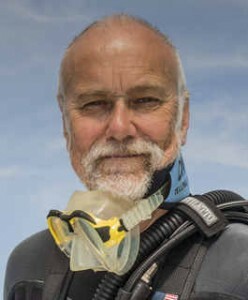 Since then a vast number of divers have taken to rebreather diving. Technical divers began doing dives that were unheard of using traditional open-circuit scuba due to the amount of gas they would otherwise have needed to carry. Familiarity can breed contempt. Confident divers were still coming to the surface with counter-lungs inflated as their unit attempted to give them more oxygen in the shallows than they needed at depth. This meant they could float comfortably without resort to their BC. If they closed the mouthpiece and breathed fresh air, I suppose there was no problem. However, many stayed breathing from the unit (part of regular CCR training) but if they turned off their O2 supply, as a prelude to getting out of the water (and NOT part of CCR training), unconsciousness followed by loss of buoyancy as the mouthpiece fell from their mouth. It could occur almost within seconds, followed by drowning. Whether this was actually what happened or not, one could easily imagine the Sharkwater film director doing something similar before he dropped and died in the first days of February 2017. He had surfaced presumably with his camera and given an OK signal when his buddy appeared to lose consciousness. The boat crew, distracted with saving his buddy, took their eyes off Rob Stewart who was found on the seabed directly below where they were, some days later. He had dropped and drowned. It was a tragedy. Modern CCR units have many convenient features built-in, unlike those early prototypes. There are audible and visual alarms with head-up displays. However, there will always be the insidious dangers of hypoxia and hypercapnia, both unforgiving in a water environment. People often obsess with oxygen toxicity but subject to effective oxygen cells being employed, this rarely happens although there have been examples of people switching to the wrong gas on their conventional open-circuit bail-out. Nor has any CCR manufacturer been successfully sued for making a faulty unit although one manufacturer found all its profits going to lawyer’s fees. Many CCR users have personally modified their units from the manufacturer’s specification and some have paid the ultimate price for that. Unlike conventional open-circuit diving, rebreathers leave little room for mistakes. Get it wrong and you pay the ultimate price. The fact I got away with it in the early days, I put down to luck and nothing more. Some dive operations prefer to steer well clear of them. In twenty years of regular diving I’ve had three dive buddies die. They weren’t diving with me at the time as they’d got themselves YBODs. I find this rather discouraging. You have to be particularly dedicated, organised and sensible to cope with a rebreather. That’s why I’m not getting one.